Honor your stepmother with this personalized Poetry Gift for her birthday or Mother's Day. 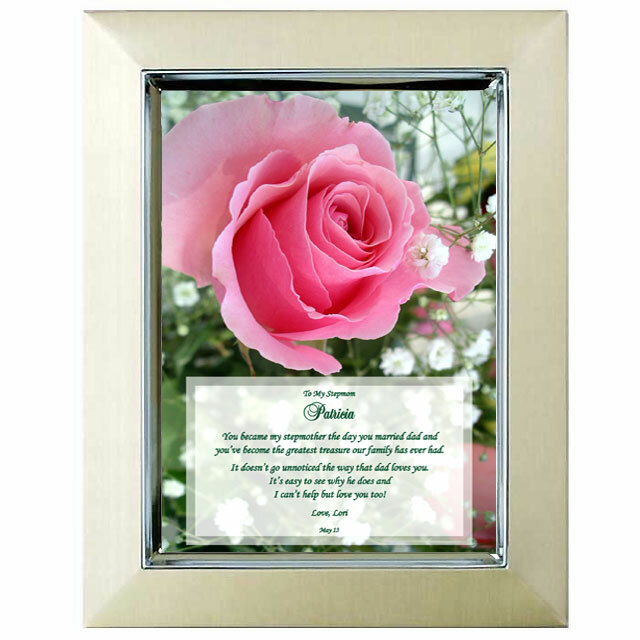 This heartwarming poem in a stunning pink rose design will surely warm her heart. The personalized poem is presented in a striking gold brushed metallic picture frame with a thin silver border. The 5x7 inch frame is suitable for displaying on a shelf or table or it can be hung on a wall. Outside frame dimensions measure 7" x 9". you've become the greatest treasure our family has ever had. It doesn't go unnoticed the way that dad loves you. I can't help but love you too! we can't help but love you too!